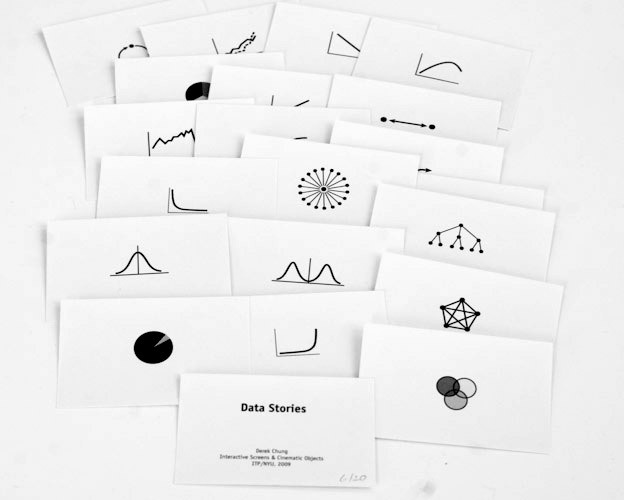 Data Stories is a set of 20 2"x3" cards, each printed with a simple, unlabeled graph or diagram. The graphics symbolicallyrepresent a variety of common phenomena, and the viewer is free to make associations with each. For example, the first graph in the upper left is a Venn diagram, which can be used to describe a variety of situations where individuals share some characteristics, or groups of people or objects share some common members. The intended usage of the cards is open-ended - people can pick out individual cards to match them with observed phenomena, or pick several cards at random to generate a story. Increasingly in modern society, we are shown graphs and diagrams to explain complex phenomena, and they represent a particular way of seeing and thinking about the world. Abstracted, many of these are similar. Commonly-used graphs are associated with a variety of stories (a stock crash, a rivalry, a hierarchy or patriarchy, equality, fame, etc). Clay Shirky uses a few (e.g, "the perfect network" and "the power law graph") to explain a number of social behaviors in his classes at ITP. Data Stories simply attempts to capture a subset of these to enable us to recognize these patterns and commonalities, and to generate narratives from them.